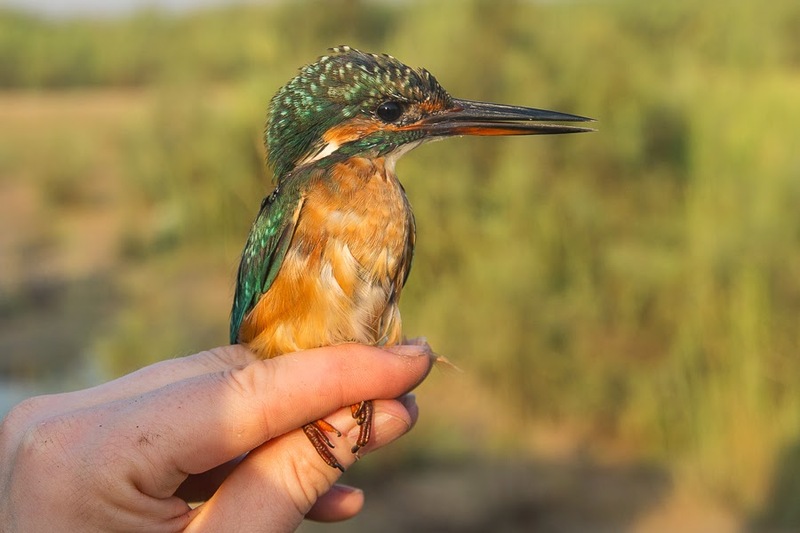 Whilst ringing on 17 October we caught a two Great Reed Warblers and three Indian (Clamorous) Reed Warblers as well as a few other birds including Common Kingfisher, Little Bittern, Graceful Prinia and Bluethroat. It was a little windy and we were limited on time so set out at 03:30 to allow us to reach the site and set the nets before first light. We put up five nets in our usual positions although the wind made moving one to a less windy position necessary after about one hour. All the nets caught birds but it was quite slow. 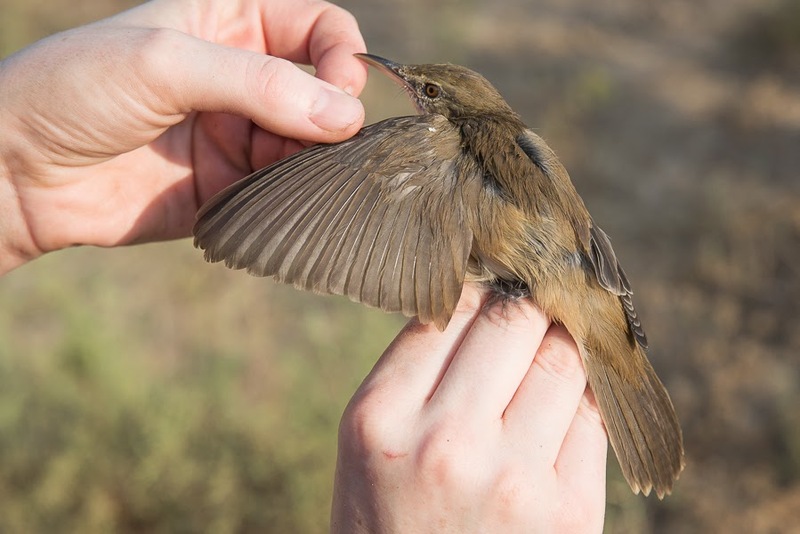 Sabkhat Al Fasl is proving to be a much better ringing location than Alba Marsh, and although we do not catch too many birds the numbers are significantly higher than Alba. 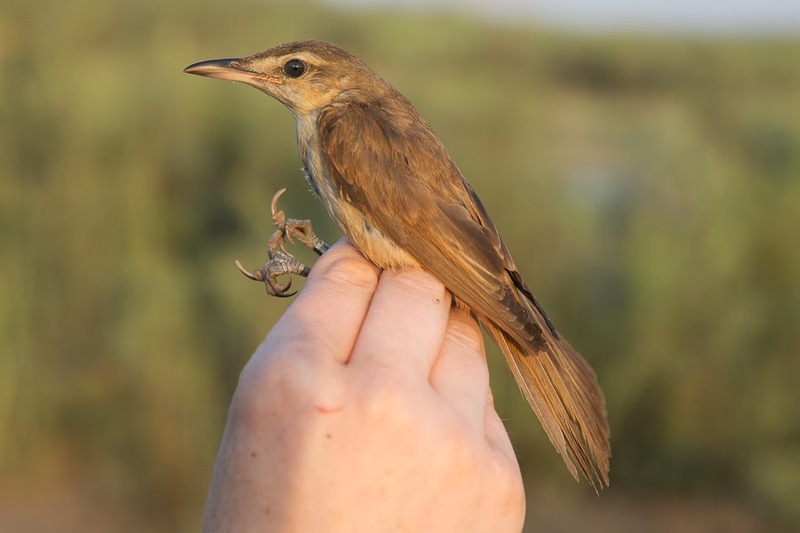 On the 17 October we caught eleven birds of six species whilst at a similar time of year last year at Alba we caught three birds all of which were Great Reed Warblers. 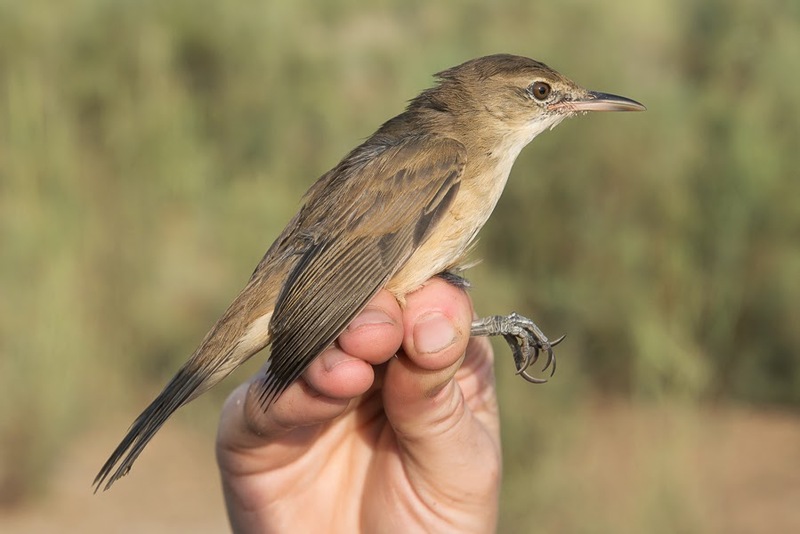 The subspecies of Great Reed Warbler we get is zarudnyii which is the eastern breeding race and is generally lighter in colour with more olive, less rufous brown upperparts than nominate arundinaceus. 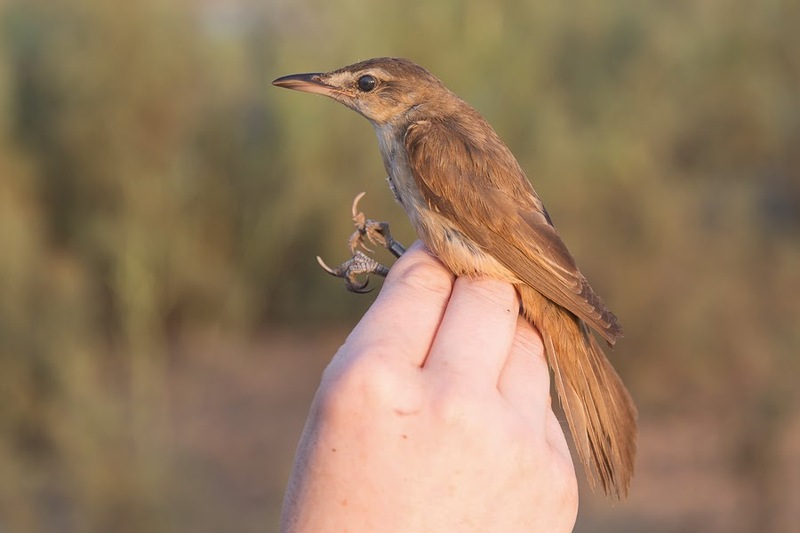 Acrocephalus arundinaceus zarudnyiis sometimes treated as an eastern subspecies of Great Reed Warbler Acrocephalus arundinaceus and sometimes as conspecific with A. a. arundinaceus. 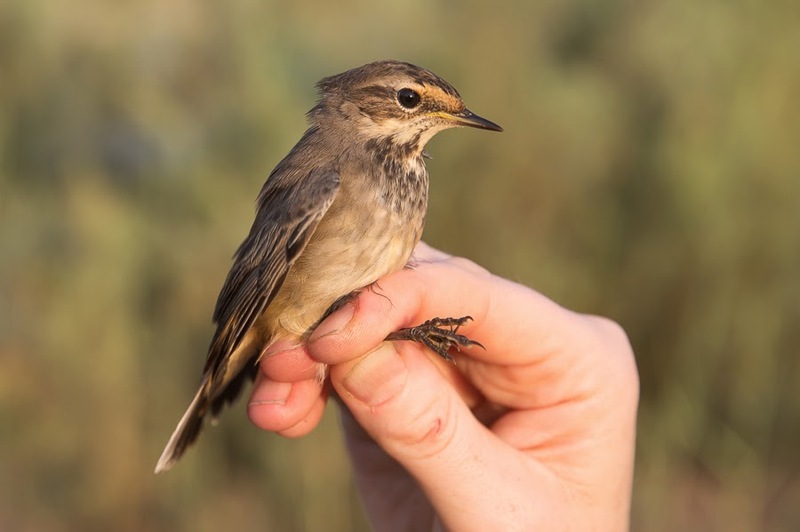 A. a. arundinaceus occurs from Europe east to the Volga River and A. a. zarudnyi occurs from the Volga River east to southern central Siberia, although birds resembling zarudnyi occur in western European populations of arundinaceus. 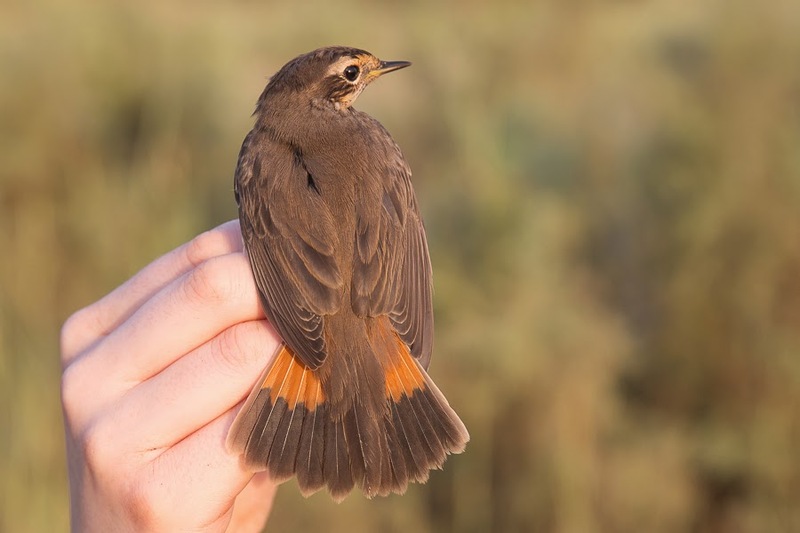 It has thus been suggested that they are actually colour morphs with darker birds in the west and paler ones in the east.